One of our favorite sea creatures rendered with a light-as-air crisp. The fritto misto is a regular presence on the majority of Italian restaurant menus, no matter whether they are of the new or old school variety. Our version ignores the dish’s usual squid companion, focusing only on the baby octopus. Or, in this case, a plateful of octopodes or octopuses: the correct plural. Mix the kosher salt with 4 cups of water until fully dissolved. Add the octopus, cover and place in the refrigerator for about two hours. 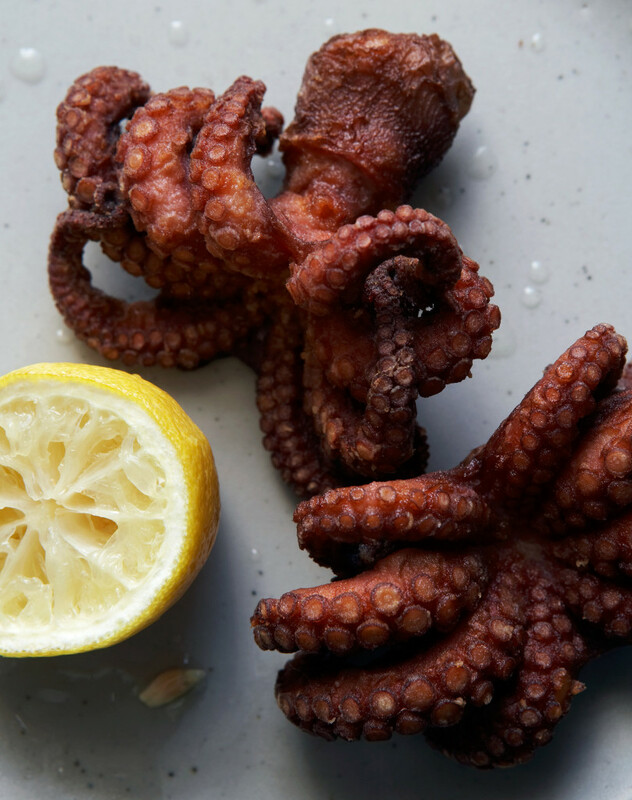 Remove the octopus from the brine and dry with paper towels. In a heavy bottomed saucepan, heat the oil—it should be about 3-4″ deep, but no more than half-way up the sides of the pan—to 360°F (use a deep-fry thermometer or a piece of bread to test; it should brown quickly). Place the ﬂour in a shallow bowl. Dredge the octopus in the ﬂour and gently shake to remove any excess. Once the oil has come to temperature, carefully add octopus, three at a time, to the hot oil. While adding the octopus, turn the heat to high in order to prevent the oil temperature from dropping. Fry until golden and crispy, about 4 minutes. Repeat, frying in batches of three. These are best served hot, right out of the oil with just a sprinkle of lemon juice. The octopus will lose their crisp, even when left for a couple of minutes.